Your dog is part of your family, so treat him like one. Make him always look his best. Regular grooming is important to keep your dog looking dapper. Grooming is also a good way of spending time with your dog and should be an enjoyable experience for both of you. Grooming is a good time to take the opportunity to check the condition of your dog’s coat and skin as well as looking for any abnormalities such as swellings, wounds or evidence of parasites. If you notice anything which is out of the ordinary, contact your veterinarian for further advice. When grooming your dog, you should check that your dog’s eyes and ears are clean, clear and free from excessive discharge. If the eyes are not clean, they can be gently cleaned with moist cotton wool; use a different swab for each eye. If the eyes are red or there is a lot of discharge, seek veterinary advice. The ears, if soiled, can be wiped with a small pad of dry cotton wool, but don't dig beyond the area you can see or poke anything solid inside. The ear is very delicate and easily damaged. Dogs with long ears are more likely to suffer from ear complaints. So be extra vigilant with these breeds. A lot of dark wax or discharge in the ear could indicate the presence of ear mites or an infection, and you should ask your veterinarian for advice. Check your dog's mouth regularly. His teeth should be clean and free from deposits, and the gums should be a healthy pink colour. As he ages, deposits may develop around the base of the teeth near the gums which can lead to bad breath, mouth pain, gum disease, infections and could eventually cause the teeth to fall out. Your veterinarian can scale the teeth to remove the tartar, remove any loose teeth, and polish them to slow down recurrence, but this usually requires a general anaesthetic. Brushing your dog’s teeth daily will help prevent this. Use either a special canine or a child's toothbrush and toothpaste designed especially for dogs. Do not use human toothpaste in dogs, as it can cause gastrointestinal upsets and is usually quite unpalatable. It is best to start brushing your dog's teeth from an early age, so that he becomes used to the routine. Specially designed dog biscuits, which help reduce the build-up of plaque and tartar are also available and can help maintain your dog’s oral health and hygiene as part of your dog’s daily diet. It is important to keep an eye on your dog’s nails. Dogs who regularly exercise on hard surfaces are less likely to need any attention as their nails wear down to about the correct length. If your dog is exercised mostly on grass, his nails may grow longer and may need trimming. Pay particular attention to their claws, if any are present, since they are not in contact with the ground and are not worn down. They tend to grow round in a circle and may pierce the pad, which can be painful and is likely to cause lameness. You can trim the nails yourself, but it is important that this is done correctly with suitable clippers. If you are not familiar with the procedure, ask your veterinarian or a professional dog groomer for help. It is also important to control your dog’s body weight and keep him in optimum condition. Feel your dog’s body, particularly over the ribs to keep a check on his weight. You should be able to feel the individual ribs under a cover of body tissue, and there should be a definite `waist' behind his ribcage. Alternatively, your veterinarian may be able to do this for you during routine visits. Any deviation from this could mean that the diet should be modified. You can ask your veterinarian for advice. Dogs only need bathing when they are dirty or on the advice of your veterinarian. Make sure that you only bathe your dog in fine weather or indoors to avoid chills. Only use shampoos and conditioners, which have been designed for use on dogs; your veterinarian may recommend a special type of product. Always read the instructions carefully before use and never use domestic detergent or disinfectants. 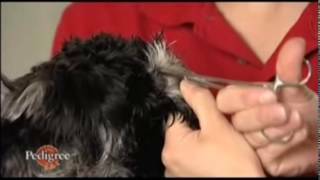 While bathing your dog, always pay attention to areas which matt easily, for e.g., behind the ears. It is much easier to prevent these matts from forming than it is to remove them once they have formed. Dogs tend to moult all year round if they are kept indoors, but they shed hairs more profusely in the spring and autumn. Brushing your dog every day during this period will help the process, and will reduce the amount of hair shed over your carpets and furniture. Long-haired dogs may need to be groomed several times a week, short-haired maybe once a week, depending on the condition of the coat. It is better to spend a short time every 2 or 3 days than to leave the coat un-groomed and encourage matted hairs. You will need a comb and brush, which you should keep especially for your dog. Large dogs are probably best groomed standing on a table, small dogs sitting on your lap. Groom the dog from the head downwards, running the brush or the comb in the direction of the dog's hair. You may need to lift the upper hair if the dog has a thick undercoat. Brush from under the coat outwards, removing dead hair and mats. If you can put the comb through the hair without catching knots, you know that you have thoroughly groomed your dog.